What is a contactless payment and how the Card Shield protects you. The POS sends a signal after which the card will respond to that. Together they agree about the security they are going to use after which the real payment is processed within this secured protocol. The payment devices used in the UK are very secure. The distance between the card and the POS may not exceed 2,5 inches, however, this is a restriction of the POS. The card gets the energy from the POS, by which the distance can be up to around 4 inches. The criminals are not restricted to use UK approved terminals, they can use a POS from another country, connected to an account in another country. 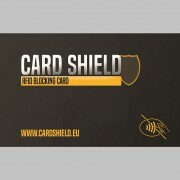 The Card Shield uses the same technology, but more sensitive. It uses the energy from the receiver as well, but generates that many noise by which communication with other cards isn’t possible. So the Card Shield blocks all communication with the cards which are in the same range of the POS’s energy field. Thus, when the POS sends its signal, the bank card will respond to that, but the Card Shield will respond with a louder signal. Because the bank card’s signal is overruled by the Card Shield’s, the POS can no longer communicate with the bank card. Only if the Card Shield is outside the energy field from the POS, it will not have influence on the transaction, so a wanted payment can still be made. We don't promote making accounts, however, if you want to manage your order, you can create an account.